April 22, 1975 was a busy day for transactions by the Philadelphia Eagles. Guard Mark Nordquist was traded to the Bears and CB Charley Ford to Houston, both for draft choices. The most noteworthy deal sent PK Tom Dempsey to the Los Angeles Rams for an undisclosed 1976 draft choice (it turned out to be a fourth-round pick, which was later traded to Green Bay). Dempsey, who was 28, had gained notoriety with the New Orleans Saints in 1970 when he kicked a 63-yard field goal that not only gave the Saints an upset victory over the Detroit Lions but broke the existing NFL record for longest field goal by seven yards. Born with only two fingers on his right hand and half of a right foot, Dempsey overcame disabilities to play offensive tackle in high school and defensive end at Palomar Junior College. He also took up placekicking, and when the Chargers of the AFL signed him to their taxi squad in 1968, a special shoe was designed for him with a flat surface like a mallet. A placekicker with the size of a lineman (6’1”, 260 pounds), he had considerable leg strength. 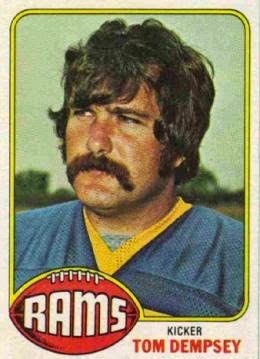 The Chargers released Dempsey after a year and he joined the Saints in ’69, gaining Pro Bowl recognition as he booted 22 field goals. He kicked another 18 in 1970, but while he could kick for distance, he had problems with accuracy. Three of his attempts of over 50 yards were good, as well as four of seven from 40 to 49 yards, but he was successful on only one of five tries from 30 to 39 yards. He was beaten out in the 1971 preseason by Skip Butler (who failed to last past the second game) and was activated by the Eagles midway through the schedule. Dempsey’s half season with Philadelphia in ’71 was outstanding as he succeeded on 12 of 17 field goal attempts for a league-leading 70.6 percent. Among those kicks was a 54-yarder at home against the Cardinals that set a new team record (eclipsed by Tony Franklin in 1979). Dempsey kicked for another three years with the Eagles, but was never again as consistent. While his field goal total rose to 20 in 1972, he had 35 attempts for a percentage of 57.1. His most notable performance was six field goals in an 18-17 win over the Oilers, another team record, and in a game in which the opposing kicker was, ironically enough, Skip Butler (who missed a potential game-winning kick). He set a then-club standard with 24 field goals in ’73, out of 40 tries, but had a noteworthy 26-yard field goal miss in a one-point loss at Buffalo and was still less-than-dependable on midrange kicks. In 1974, the NFL made two rules changes that had a notable effect on placekickers, including Dempsey. The goal posts were moved from the goal line to the rear of the end zone and failed field goal attempts beyond the 20 yard line were returned to the line of scrimmage rather than the 20. Dempsey had just 16 field goal attempts for the year and was good on 10 of them. There had been acrimony between Dempsey, who was the team’s player representative, and Eagles owner Leonard Tose during the players’ strike prior to the ’74 season, and there were rumors throughout the year that the placekicker’s job might be in jeopardy. Eagles Head Coach Mike McCormack indicated that the deciding factor in dealing Dempsey was the rule change regarding long missed field goal tries. The Eagles filled their placekicking vacancy by obtaining Horst Muhlmann from Cincinnati, and he was successful on 20 of 29 field goal attempts (69 %). Only one attempt, which was good, came from over 50 yards although many were in the 40 to 49-yard range, with a success rate of 7 in 13 tries. Dempsey, meanwhile, made good on 21 of 26 field goal tries for a career-best 80.8 percentage in his first year with the Rams. His longest covered 51 yards, he was four of five from 40 to 49 yards, and was perfect (7 of 7) between 20 and 29 yards for the first time in his career. However, he paradoxically missed five of his 36 points after touchdown. Dempsey’s performance slipped in 1976, as he went 17-of-26 on field goal attempts and was unsuccessful on eight of 44 extra points. In the NFC Championship game, his blocked chip-shot field goal attempt in the first quarter was returned 90 yards by the Vikings, who went on to win the game – the last for Dempsey with LA. He was waived the following preseason. Dempsey saw action with the Oilers and Bills over the next three years. Overall, he kicked 159 field goals out of 258 attempts (61.6 percent) and 89.4 percent of his extra point tries (252 of 282). Most of his field goals came with the Eagles (66) and he had a total of 38 with the Rams, but it would be the 63-yard kick for New Orleans for which he would be best remembered.